This was one of my most highly anticipated reads for fall. 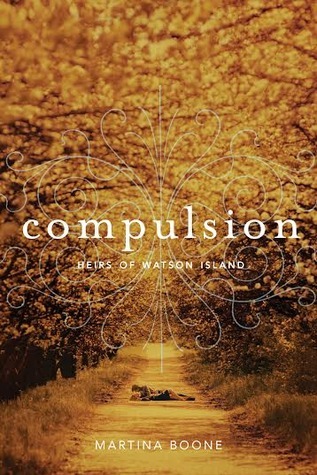 I loved everything about it from the gorgeous cover to the alluring synopsis and I couldn't wait to dive right in and discover all the secrets of the Watson Island. I am so glad I picked this up, sometimes intuition pays off and a pretty cover and synopsis isn't just a pretty cover and description, it is something great and fun and so worth it to read. I really loved Lo and Barrie (Bear). There was just something so..perfect about them. Their instant connect (NOT insta love) didn't make me roll my eyes or want to gag like so many insta loves do these days, it just fit the entire feel of the story and made complete sense. The mystery behind the Fire Carrier and the curses and gifts was so captivating. Combine that with the mysterious and beautiful Southern gothic setting and this whole storyline just called to me. Throw in a plantation that seems to take on a life all it's own and you truly have a read perfect for this time of year, or any time really. We don't get all the answers because, after all this is only book one but we get just enough to whet our appetites and crave more and I was left craving more by the end. I simply can not wait to see what happens next. I loved Eight, Pru, Mark, Barrie, Mary, and even Seven so very much and I devoured this read. I wasn't ready for it to be over and I will be on pins and needles waiting for book two to be out. Don't forget to check out all the great giveaways, fun, and guest posts for the Something Wicked Strikes Hop! There is something new and excited every day this month! I don't mind not having all the answers because it leaves me salivating for the next book. Though I do like to moan about said open-endings because FEELS. I'm glad you loved this! Thanks Allie! I really did and am excited for book two. I didn't love this one as much as you did, but I'm happy you enjoyed this, especially because it's your most anticipated read of the year. Thanks Nick and I am sorry you didn't love it as much. I'm glad to hear this is more of an insta-connection than insta-love. The characters sound wonderful, and even though you didn't get all the answers, it sounds like it's satisfying enough for a first book. Lovely review! Thanks Lauren, it really was a solid first book. Can't wait to read this Ali! SO glad to hear it's not insta love. I absolutely believe in an instant connection, so I think that aspect will work well for me. *runs away to start reading* Beautiful review! The cover is perfect for a fall release. It was perfect for this time of year. I hope you like it too Kim! Sometimes, I can forgive instant-love. It all depends on the build up. I'm glad this one doesn't feature one, though. Yay for Martina! This one's been on my TBR list for a while, but I'm thinking I better wait until another couple books are out so I can binge read--like I know I'll want to. I really loved this one! So atmospheric and I loved the unique paranormal aspects! I have this one up next week, and I enjoyed it as well. I loved the whole mystery element. Yay! Glad you liked it too Heidi. Oh this sounds good..I love a story set on a plantation..perfect for mystery and paranormal elements! Me too Kim and this really was great, especially for this time of year. Plantations? I like it already! Ghosts are expected adding a curse makes the story very interesting. It was really interesting Braine. :) I hope you decide to try it. I love a good ghost book, it's been a while! I haven't read this one but a friend wrote a wonderful review and told me it was her fave of 2014 so definitely intriguing! I hope you give it a try then Melliane, I bet you like it too. Glad to see that you loved this one, dear! I read some negative reviews and it really threw me off guard and it made me not want to read this book at all. Ghosts are awesome for me (way more than the other supernatural stuff like vampires and werewolves) so that's a reason to give this a try. Thanks for highlighting it! The ghosts are a very minor part in the story so that could be why some were disappointed. So many people have been reading and really enjoying this one. Bear heh, I need to add this one to my list, it sounds charming. I am so glad you liked it! I fell in love with this cover the moment I saw it! Yes! The cover is just gorgeous! Thanks so much and definitely, if you like this type of read give it a try, I think it is worth it for sure.